So you want to have a rocking stereo in your car, but don’t have a lot of funds to buy it? Look no further. 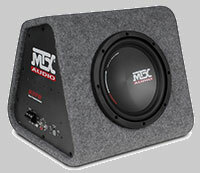 These MTX Audio components can make your car audio sound awesome! 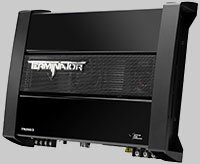 Start by upgrading your stock speakers with these unbeatable values offering great MTX amplifier and speaker combos. Replace your flimsy stock car speakers with the much better quality sound, and heavier construction, of these awesome MTX speakers, and add to the power of your weak head unit (radio, etc) with an MTX amp that can truly shake your booty. The result will sound like a concert on wheels! Start your upgrade with rich sounding MTX Terminator Speakers and a 100-watt-per-speaker MTX Terminator TN200/2 Dual Channel Amplifier to get your party started. No need to change your head unit. You will be amazed at how the same song you heard yesterday comes alive today on your new MTX system. Depending on the speaker size you are replacing, this system will cost you about$140 to $190 plus wiring. 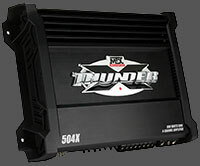 Now you can really jam with this front and rear surround, MTX Terminator Speaker System complete with four channel MTX XThunder Amplifier providing 50 watts per speaker. Plenty of power to make the windows rattle! This combo will run $200 to $300 depending on speaker size again. If you are upgrading your audio from stock, adding a subwoofer by itself can make a big difference in your sound. But I recommend doing it right by adding the new speakers first. You won’t regret it. (And you know how upgrading only part of the system is just going to bug you about the part you didn’t) Just add the sub soon to get that full live concert sound. Either of these two subs hit surprisingly hard and solid for an eight inch woofer. Check out what our fans say… I have one in my car! Adding good bass to your car will bring the music alive. Get wailing dual 10” subwoofers with a matched, built-in amplifier in our MTX Magnum Dual 10" 400W RMS Vented Enclosure with Amplifier for $200. Throw it in the trunk or the back seat and you’re slamming it with the big boys! You need wire so recommend buying the Magnum Kit with the StreetWires package for $240. "...just as a quick replacement without breaking the bank , until I decided what subs and amp I was going to get . Well let me say this combo package blew me away..."
"...they are loud and will shake the mirrors and your rear end . But I mostly buy subs for sound quality and ... They sound so good , I don't want to change them." So now you have a couple ideas on how to quickly get your car audio ready to party bigtime on a small budget. Enjoy the music! 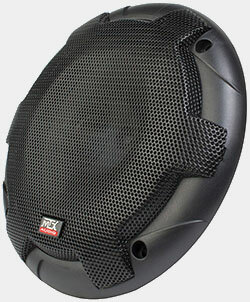 MTX Vehicle Speaker Fit Guide - Check on what speakers fit your car or truck.